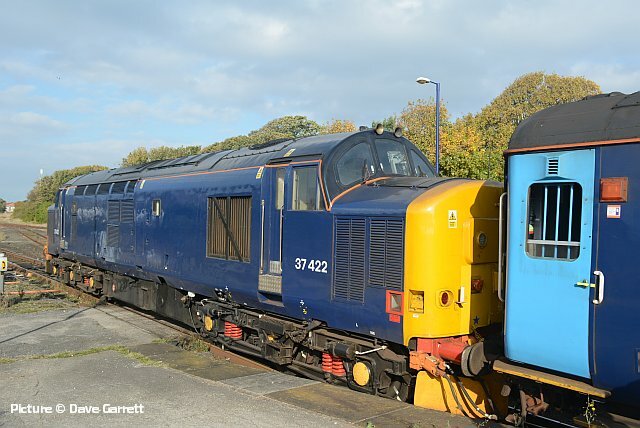 The Class 37 diesel electrics were designed and built in the 1960s by English Electric, and classified as 'Type 3' based on their engine rating of 1750 bhp. For many years the class was an uncommon sight on London Midland metals, a famous exception in the 1970s being the daily Harwich – Manchester boat train which brought an Eastern Region loco to Manchester. Fast-forward to the 'Thatcher years' of the mid-1980s when 'modernisation plan' rolling stock from the 1950s was becoming life-expired, and money for new DMUs was scarce. 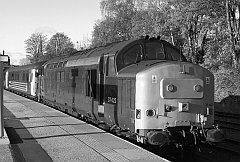 A programme was devised to refurbish Class 37s, by then mostly used for freight services except in the Scottish Highlands. The BR passenger business was authorised to include in the programme 31 locos which would be provided with circuitry to provide power to electrically-heated carriages. Examples from the later-built batches of the class were chosen. These were classed as 37/4, and were turned out by Crewe Works in 1985-86, all in the then-new 'large-logo blue' livery. 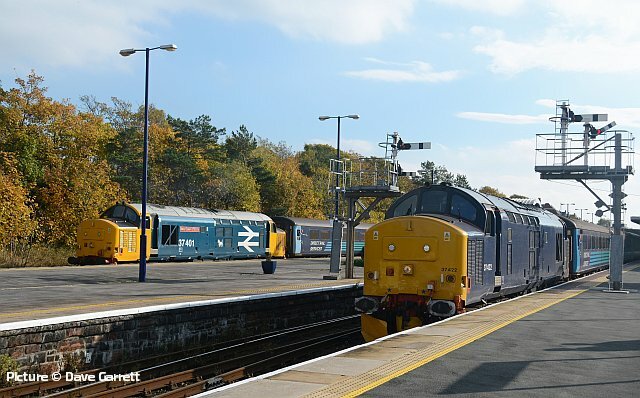 37 401 to 37 425 went to Scotland where they took over from older 37s on Highland duties based at Eastfield and Inverness depots. 37 426 to 37 431 were for Cardiff Canton depot, to work North West England – South Wales expresses and through trains from London and Birmingham to the Cambrian lines. My first extended experience of the type was in 1987 when we spent two weeks in a cottage at Corpach alongside the entry lock of the Caledonian Canal, and we had many happy journeys and took many photographs. Among the locos then in service on the West Highland was 37 422, which arrived at Eastfield depot in January 1986 and stayed on West Highland passenger and freight duties until 1989 when Class 156 units took over all workings except the Fort William leg of the Caledonian Sleeper. Unlike most of the other Scottish 37/4s, it was never named during this period. The 37/4s saw use on various duties over the next few years, finding themselves allocated to the Railfreight sector, although they also appeared on passenger trains, especially when the new Class 153 DMUs were taken out of service with door-locking faults. In the spring of 2003, Regional Railways North West, after finding themselves allocated fewer new Class 158 units than they had hoped, decided to institute several 37/4-hauled diagrams on the North Wales Coast line, including the Manchester – Holyhead 'Irish Mancunian' service. 37 422 was one of a batch of 37/4s hired from what had become 'Transrail Freight' and based at Crewe Diesel Depot. They also saw service on the peak-time 'Club Trains' between Manchester/Liverpool and Blackpool/Southport. Rolling stock for the 4- or 5-carriage North Wales trains was mainly early Mk2 vehicles with some refurbished Mk1s. Initially, most workings were between Crewe and North Wales, but later some were extended to Birmingham, running one way round the Soho loop line to avoid a run-round manoeuvre at Birmingham New Street. 37 422 entered service as D6966 in 1965, becoming 37 266 in 1973 and finally 37 422 on rebuilding in 1986. It gained celebrity status on 3 May 1993 when, repainted in the colourful Regional Railways livery, it worked a special train from Crewe to Blaenau Ffestiniog for a ceremonial naming to Robert F. Fairlie, Locomotive Engineer 1831-1885, with one of the Ffestiniog Railway's Fairlie-designed locomotives in attendance. 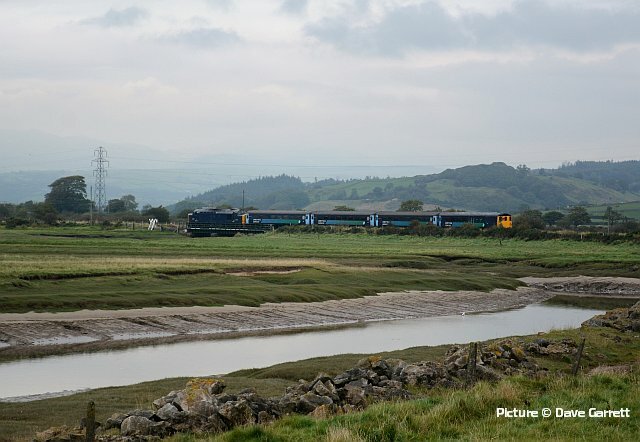 Over the next five years I made many journeys on the 37-hauled North Wales trains, and when in 1996 I had the opportunity to create World Wide Web pages, I took the opportunity to set up a site celebrating these marvellous trains. 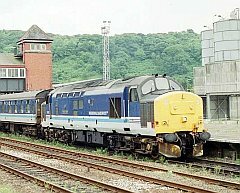 Against all odds, this website (www.nwrail.org.uk) outlived the replacement of the 37/4s by 175 units and is still going, 21 years later! Since then there always been at least one loco-hauled diagram in North Wales – at the time of writing there are two diagrams on Mondays – Fridays, one to Cardiff and the other to Manchester, with Class 67 power. Why is 422 my favourite? Others come to mind, notably 37 408 Loch Rannoch which famously retained its large logo blue livery after all the others had been repainted, and caused a when EWS repainted it in their livery and left off the nameplates, only to replace them after protests by enthusiasts. Many North Wales railfans will probably choose 37 429 Eisteddfod Genedlaethol which worked the first and last trains of the North Wales 37/4 era. But I remember 422 for several journeys on the 'Irish Mancunian' after it had been transferred from Manchester Victoria to start from Stockport and serve Piccadilly. The train ran empty-stock from Chester to and from Stockport via the Cheshire Lines route. January 2001 saw the 37/4s finally displaced from regular North Wales passenger work, later than planned thanks to many troubles with the new Class 175 DMUs. 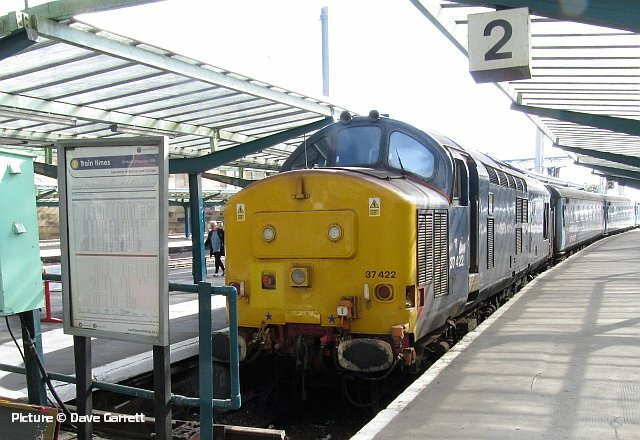 37 422 worked its last North Wales turn for First North Western on 19 May 1999, and moved to South Wales where it worked mostly on the Cardiff - Rhymney and Bristol – Weymouth passenger routes until October 1999 when it was placed in store, only to be revived, and re-named Cardiff Canton, in February 2003. Soon afterwards it was transferred to a 'tactical reserve'. By then it had passed out of my consciousness, although it did make a couple of appearances on the Friday-evenings-only Cardiff to Manchester train when ran for a while. 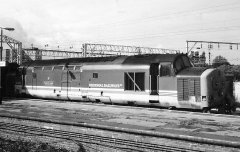 At that period it was also a favourite for use on railtours with EWS haulage, usually double-heading with another 37/4. Eventually it was placed in storage by EWS in September 2008, and I thought I'd never see it again. But miracles can happen. 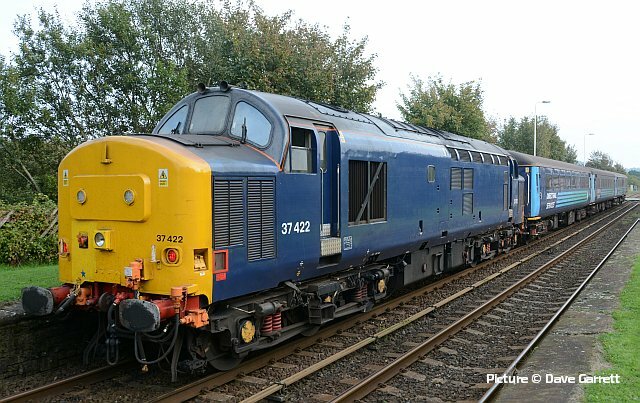 422 was one of several locos bought by DRS in 2011, and after a complete overhaul by the Harry Needle company at Barrow Hill it re-entered service (nameless) in 2015 working passenger trains in East Anglia, where the Greater Anglia company was suffering a chronic shortage of DMUs for the local lines from Norwich to Great Yarmouth and Lowestoft. 422 also made some appearances on the Cumbrian Coast passenger workings, as Dave's pictures prove. At the end of 2016 my wife and I took a short break in Norwich, and enjoyed a pleasant journey or two behind what is undoubtedly my favourite British loco. 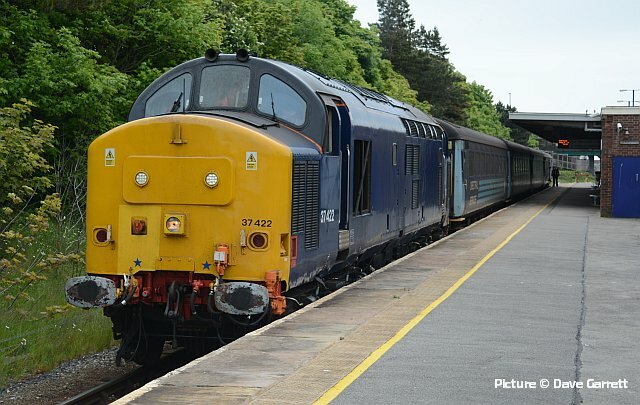 As a supplement to my 'favourite loco' article in The Mancunian (reproduced opposite), Dave Garrett has kindly supplied a selection of images of 37 422 at work for DRS on the Cumbrian Coast passenger services in 2015 and 2017. Sadly, this era of loco-haulage on the line ended in December 2018. - Charlie Hulme. 2C47 Preston - Barrow. passing Park House Farm, Roose. on 8 October 2015. On 9 October 2015 with mini snowploughs waiting to depart from Barrow with 2C49 for Carlisle. 37 422 leaves Kirkby-in-Furness under heavy skies for Carlisle with 2C49 on 9 October 2015. 37 422 heads for Barrow carriage sidings after arriving from Preston with 2C47. 37 401 Mary Queen of Scots waits to depart with 2C49 to Carlisle. Sometimes the train from Preston would continue to Carlisle. 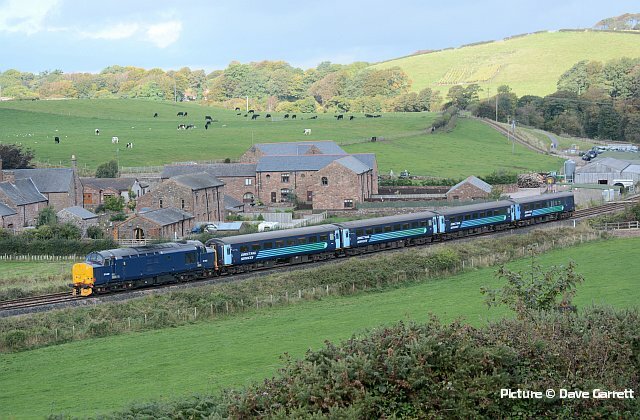 Again heading for the sidings, 26 October 2015. The carriages were fitted with vertical bars to the drop-lights to prevent anyone leaning out, especially with regard to the restricted clearances on part of the route. 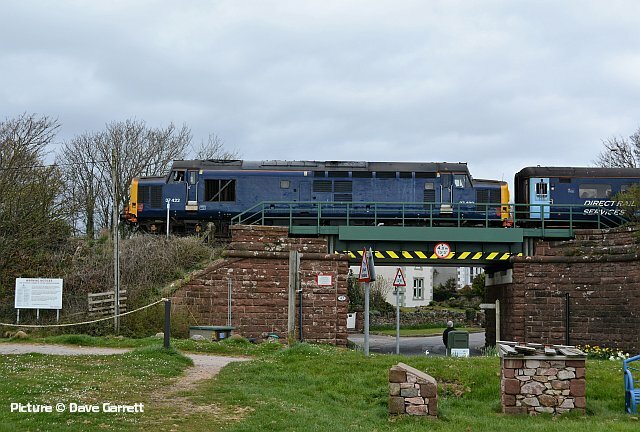 Departing Ravenglass for Carlisle, 11 April 2017. 66 433 takes failed 37 422 back to Kingmoor passing Park House Farm on 18 April 2017. 37 422 now minus mini-ploughs waits to depart from Barrow, 24 May 2017. 37 422 propels 2C33 Carlisle to Barrow out of Askam, 25 September 2017. Unusually arrived at Carlisle bay platform 2, rather than the normal platform 1, working 2C41 from Barrow on 25 September 2018. 5C47 11:42 Barrow-in-Furness -Barrow C.S. 5C42 20:38 Barrow-in-Furness - Barrow C.S. 5C31 18:48 Barrow-in-Furness - Barrow C.S. The story begins in early 2015, when Northern Rail found itself very short of trains after the Department of Transport in its wisdom had taken away come of their class 156 units for use by another company. The Cumbrian Coast line from Barrow to Carlisle,, although generally rural, has high levels of peak-time use, notably by staff of the nuclear installations at Sellafield, and serious overcrowding was occurring. 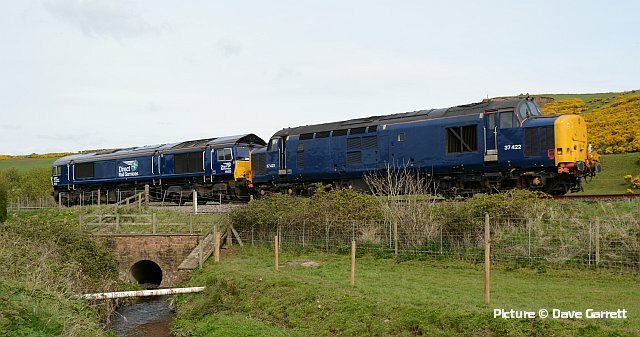 DRS, based in Carlisle, which is part of the nuclear group and owned - in the end - by the Government, had experimented with a loco-hauled service for Sellafield in 2012, and also worked the temporary shuttle service between Workington and Workington North following flood damage to the town's bridge in 2009-10. 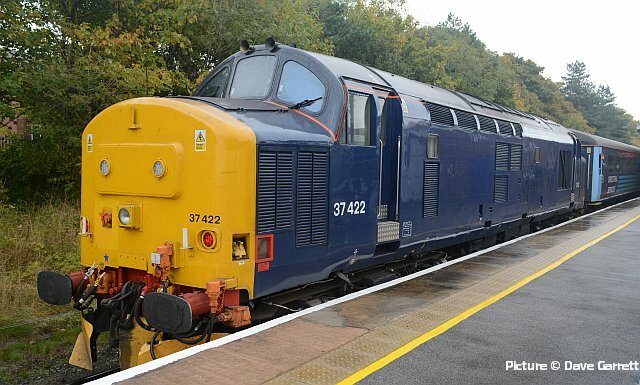 In 2015 the Department of Transport agreed to subsidise two weekday diagrams on the line, powered by DRS 37/4s (initially top-and-tailed, later push-pull with a driving trailer vehicle originally converted for the Glasgow - Edinburgh service. Operation began in May 2015, and was immediately popular with enthusiasts - less so with customers due to late running and loco failures. The air-conditioned Mk2 coaches featured the DfT logo on the sides in addition to Northern. In March 2018 one of the diagrams was turned over to a pair of Class 68s, but this was short-lived; one of the diagrams was replaced by 156 units later that year and a single class 37 diagram continued until 28 December when enough Class 156s were released by Scotrail. A 'Farewell Special' ran on 11 January 2019, just before the lease of the stock expired, using 37 409 and 37 425.